May 04, 2016 We're sorry to hear that your experience with the product was not postive. Nugenix is not a weight loss supplement, so we are not surprised you did not see significant weight loss. We do not advertise or try to market it as a weight loss supplement. 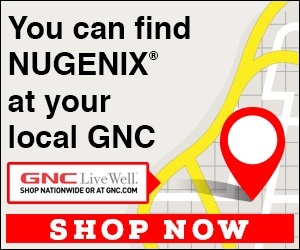 The GNC store rep is not trained to sell the product that way and we're extremely sorry to hear that they told you it would be a good choice as a weight loss supplement. its an expensive placebo. I wouldnt try it again. When I went into the GNC store I asked the counter person what would help in weight loss. She immediately suggested Nugenix. She asked my age and said that I should be able to lose weight quickly and easily. So I signed up. I was talked into buying a membership since it would save 20%. For about $100 I got Nugenix and some other supplement. I maintained my routine and there was no change whatsoever. I actually gained 3 pounds. Why would they clain that it would help lose weight? Its a lie. Just an expensive placebo. Review #784471 is a subjective opinion of User784471. We should always remember there is no such thing as a "magic pill." We in the US are all about instant gratification and are too quick to jump on the band wagon to try the next wonder supplement. With good marketing, a person off the street could fill capsules with *** and say that it is guaranteed to help you lose 100lbs and there will inevitably be a line of people anxious to try it.